Experience and Qualifications: I have spent the last three years actively involved in the Suffield Elementary PTO. I am the Enrichment Committee Co-Chair and the Grant Coordinator. Both have allowed me to work with the school administrations at Spaulding, McAlister, and Central Office. I have also been attending the Board of Education meetings recently where I have spoken out for what I feel is best for our children, their families, and the residents of Suffield. Education: I have a Bachelor of Science degree in Marine Science from Southampton University in New York and a Doctorate in Marine Science from the College of William and Mary in Virginia. Family: I live in Suffield with my husband and our 2 children. I have been a stay at home mom to my 4th grade daughter and my 1st grade boy since they were born. Community Involvement: I volunteer for the Suffield Elementary PTO as the Enrichment Committee Co-Chair and the Grant Coordinator. I am also the secretary for the Cub Scouts. After attending many of the Board of Education meetings for the past few months, I feel there is a lot of information that the public should know that is not being conveyed. The public is being left in the dark about why decisions are made and what the ramifications of those decisions are. If I was elected as a member of the Board of Ed, I would ask questions about issues that need to be explored. Our district has been trying to focus on being more data driven. This data needs to be more than a bunch of numbers presented in the meetings. The trends need to be teased out and context needs to be given. 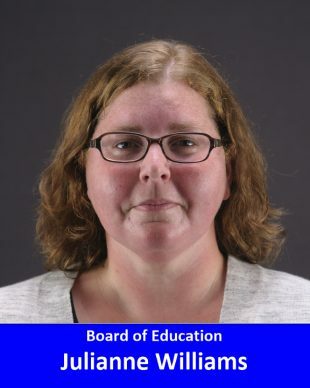 The Board of Ed members must ask detailed questions about the data so the information can be added to the minutes and made available to all town citizens. As a scientist I am comfortable with data and determining what may be important. If the district is going to be put so much emphasis on data, I feel it is important to have Board members who can interpret the data well enough to know what needs to be scrutinized. Fiscal restraint is another area where I think I can make an impact on our district. Given the condition of our state resources, the town must be increasing responsible with our fiscal decisions. There are many areas in our current budget that I would like to see further discussion among the Board of Ed. If I am elected, I know I would be comfortable breaching these topics that have thus far not been considered. Between the teachers, staff, families, and facilities, we have amazing potential to become one of the top school districts in the area.